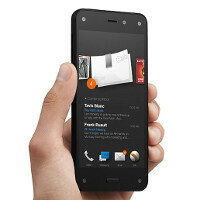 The Amazon Fire Phone, announced minutes ago on-stage in Seattle, is shaping up to be quite an intriguing device -- it's got a 3D display that is controlled by four front-facing cameras that track you face and change perspective accordingly, relatively high-end hardware, and a boatload of free, proprietary services. These include Mayday, which allows you to connect and chat with an Amazon customer service representative over video in less than 15 seconds, right from your phone; a full year of Prime membership (unlimited streaming of music, video); and Firefly, which is a sort of like the Google Goggle app on steroids. So how much does a phone like that cost, and when and where can you get it? Thankfully, unlike certain manufacturers, Amazon was quite specific in both regards. The Amazon Fire Phone will set you back $199 for the 32GB model and $299 for the 64GB model, so long as you agree to a 2-year contract with AT&T. That's right, early information was correct in that AT&T will gain exclusivity. Speaking of AT&T, if Ma Bell is your carrier of choice, you can also opt for AT&T Next 12 / Next 18-- $32.50 / $27.09 a month (32GB model) for 20 / 24 months and the ability to upgrade to a different, qualifying device in the next 12 / 18 months. The numbers for the 64GB model sit at $37.50 / $31.25 for Next 12 / Next 18, respectively. Luckily, the Fire Phone will also be available for $649 / $749 (32GB / 64GB) unlocked and contract-free. As for a release date, sales of Amazon's first smartphone will commence on July 25th, which is a little over a month from now. That said, you can already pre-order it with AT&T. Never paid and never will pay for a phone more then 300$ to 400$ max regardless of specs and innovation this phone no doubt is different and better then it's competitors in terms of bringing something different to the table. Ugh, why is Amazon making this an At&t exclusive? That kills it for me. This is worse than an iPhone 5C. The iPhone 5c and 5s has a world lte radio. Meaning it can connect to 13 different wireless Carriers without having to use slower speeds ( GPRS, edge, 3G) No other phone on the market has 13 channels. The fire phone has 9 channels, but it's an AT&T exclusive, so those extra channels are not used. The average android phone has 4 channels. The iPhone 5 2 years ago had 4 channels. So therefor those iPhone 5c specs are superior to every other phone on the market. The other companies , they bury that information. You have to really dig around to find out what channels a device operates on. Case in point the amazon fire HDX.when the iPad Air came out, all those channels were revolutionary. When the iPhone 5c came out most people thought it had the same radio as the 5, and that is not true. I hate ATT. Will wait till the exclusivity is over. Ill wait for a full breakdown a d a trip to the store before i judge the phone ots self. Why such a high price Amazon? Why only AT&T ? ??!!!!! Too expensive - Strike 1 AT&T exclusive - Strike 2 No better than an iPhone or GS5 - Strike 3. I really expected more from you amazon. I expected this phone to be $299 off contract. I expected this phone to be sold unlocked through Amazon. I didn't expect it to be available on Verizon, but seriously this is just bad business. Amazon fire phone = HTC First (Facebook phone), I doubt it will make it until September before it is free on contract and the off contract price is $399 or better. That is what it is going to take to sell this phone. Don't care about all the cameras and parallax crap. Not looking to get a 720p screen phone and will not lock myself down on a contract with AT&T. This will be 2014's HTC First. Exactly. And sadly, MOTOROLA doesn't even have ANY phones right now in the market with a 1080 x 1920 display...And MOTOROLA was once the Leader of the Pack of Cell phone companies... Sad. The pricing is a bad idea. This $199 / $299 price should definitely have been the off contract price. Hopefully, the price will drop soon on Amazon's website, or they will make it available to buy on places like HSN or QVC so as to take advantage of their "flexpay". AT&T exclusivity is also a bad idea. Did they say it would be sold unlocked or just with out a contact but still locked to AT&T? Locked on contract to AT&T for the $199/$299 price, unlocked and off contract for the higher $600-$700 pricing.